You're looking for a specific node or edge, and the search bar has returned too many results? The text you are searching for is too common! You may want to narrow you search by specifying categories/types or multiple properties. 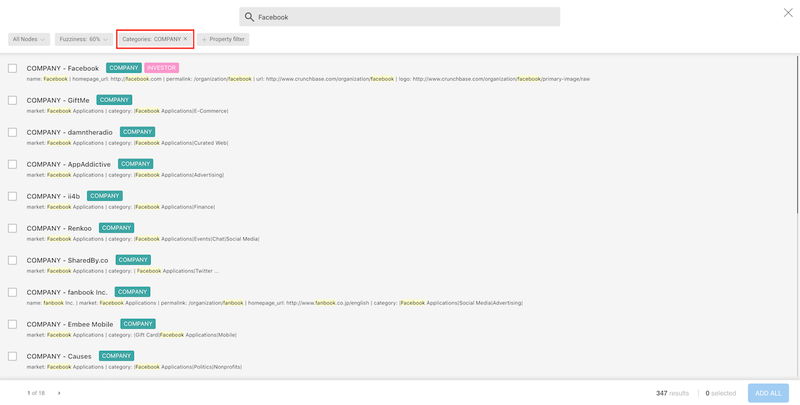 Searching for a company that contains the string Facebook in any of its properties returns a large number of results. Let's try to narrow it down. 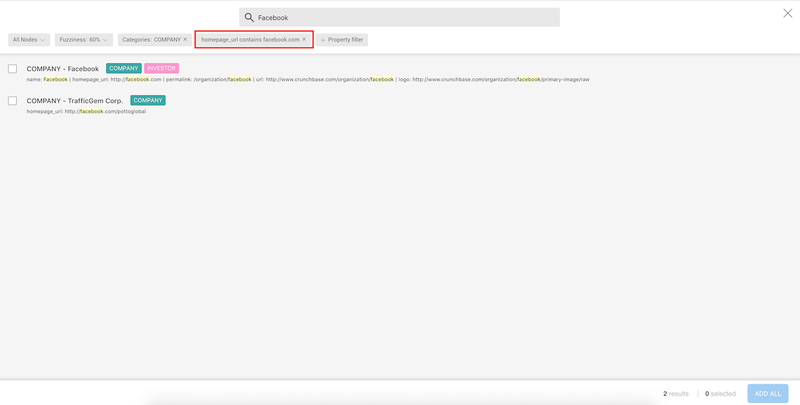 In the footer of the advanced search screen, we see the number of nodes whose properties contain Facebook (353), and we're able to review them by clicking through the result pages. 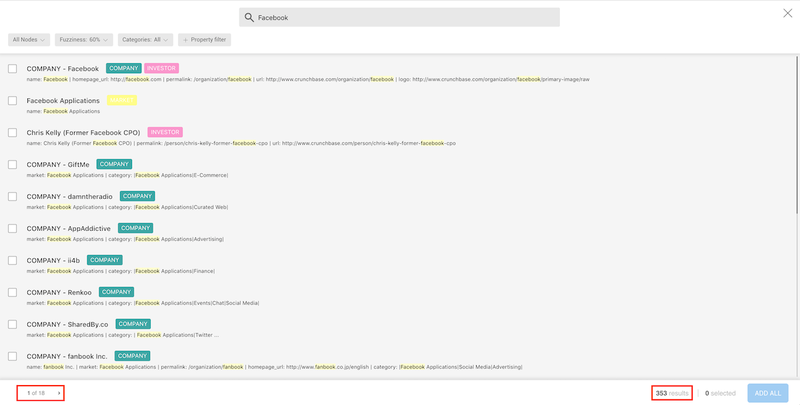 In our graph, Facebook is categorized as a Company. 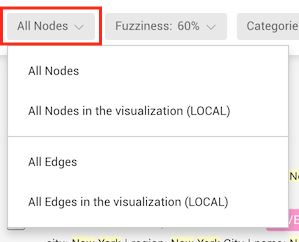 We are going to click and type Company on the category filter button to restrict our search to the nodes that have the category Company. We can now see the different results. In our graph, a Company can have properties like category, country, first_funding_at or founded_at and more. Not all the nodes categorised as a Company will have all the properties, though. In order to narrow down our results, we are going to search multiple properties at once. 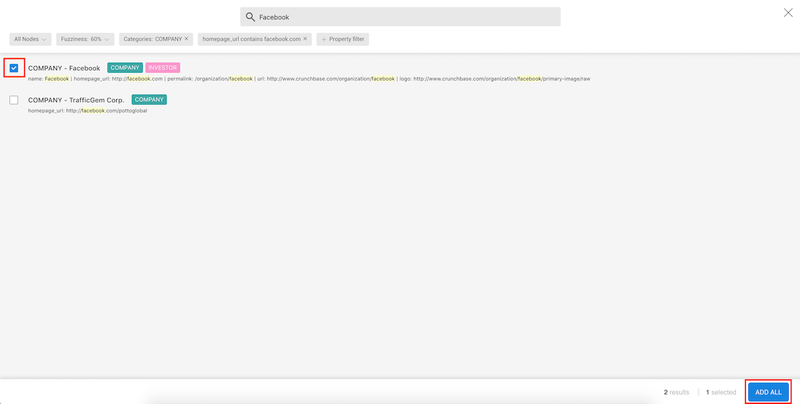 To find Facebook, we are going to look for a company that uses "facebook.com" as its homepage url. 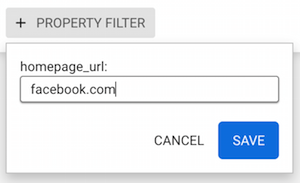 Now when we type facebook, the results are filtered to show only the nodes that have the category Company and the value facebook.com for the property homepage_url. We can see that the results are now filtered. We can now select the result we are interested in by clicking on the select box on the left side of the result, then on the ADD ALL button. The same approach can be applied to searching for edges. 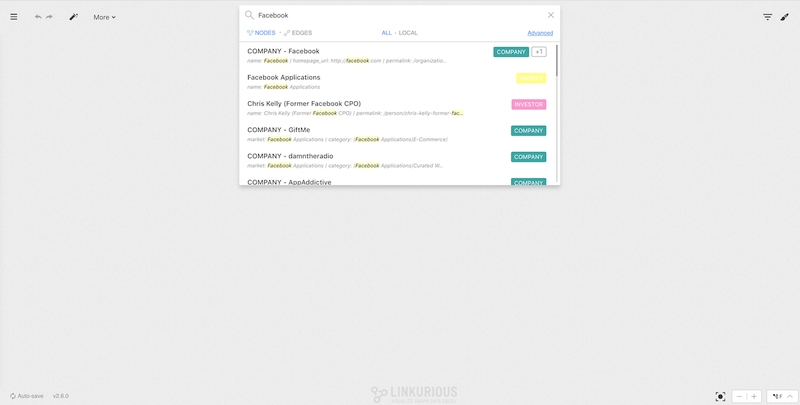 Linkurious Enterprise will look for exact matches for the values you enter in the search options menu.